Aiming to include VdB 42 and VdB 44, this image shows a part of the very well known nebulae M 42 (Great Orion nebula) and NGC 1977 (Running Man Nebula), as well as other objects (see the annotated mouseover). VdB 42 is illuminated by the star HD 36412, a white star of spectral class A7V, It is eclipsing variable, and thus also has the variable star symbol EY Orionis. The variations in its brightness are between the ninth and the tenth magnitude, and its period is approximately 16.7 days. The light of this star gives to the surrounding gas a white-bluish colour. 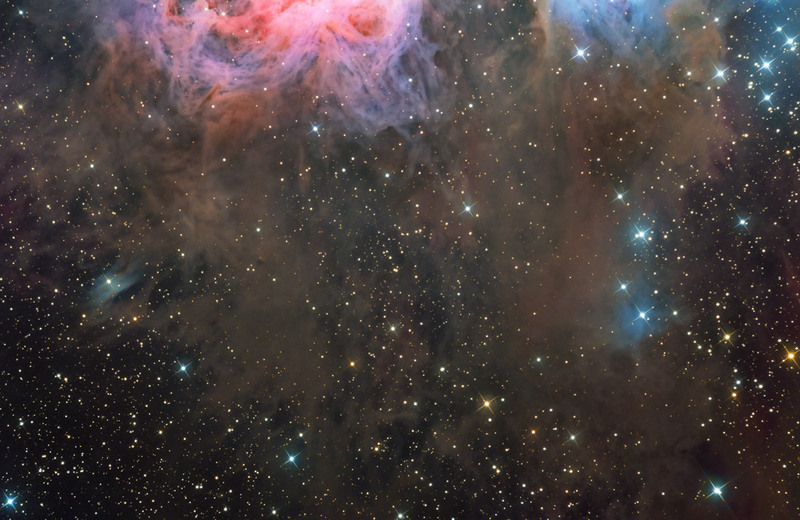 With a parallax of 2.61 mas, corresponding to a distance of 383 parsecs (1250 light-years), the nebula and the star associated with it, would be physically located in the region of the Orion molecular Complex, and in particular in the part of the complex, that includes the ionized gas region of the Orion Nebula. The other VdB object - VdB 44 (also catalogued as IC 420, DG 56, or Magakian 107), also belongs to the same star-forming region. It appears in the blue, due to the radiation of the stars immersed in it. The brightest member and the main light source, is HD 36540, a blue giant of spectral class B7III, whose distance, deduced from measurements of the parallax (1.85 mas), is 540 parsecs (1762 light-years ). It is also a variable star of type SX Arietis, with a high rotational speed, cataloged also as V1101 Orionis. The entire region is affected by phenomena of intense star formation, both recent and still ongoing, as testified by the presence of several HH objects and other structures related to young stellar objects.